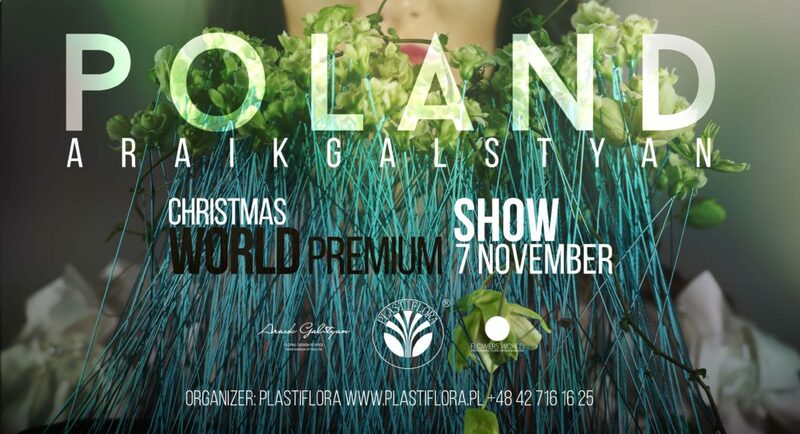 Browsing articles from "Июль, 2016"
On November 7 in Warsaw will host the Christmas World Premium show of Araik Galstyan. The organizer of the show company Plastiflora. During the demonstration Araik Galstyan will use materials from the company Plastiflora. from 11-16 of October, November, December. Classes at 10th Vozdvizhenka str, Moscow. July, for all lovers of floral art in Asia, has become a unique month. China Association of florist-designers held a unique beauty event in China. The first biggest expo International Horticultural Exposition Tang Shan 2016. As part of the expo organized Тhe 4th China Cup flower design competition. The organizers invited the world famous florists Araik Galstyan, champion EуроЦуп 2016 Tamás Mezőffy. Their show has become part of the program awards ceremony China Cup flower design competition in 2016. Describe with the words all the beauty of floral works is meaningless. All you can see in the photo of the event. The organizers, guests, florists, contestants, assistant looked admiringly on the scene working Araik Galstyan and Tamás Mezőffy, creating amazing arrangement. 3rd place -Certificate to study for 300 euros Araik Galstyan Moscow International Floral Design School. 2nd place — -Certificate to study for 600 euros Araik Galstyan Moscow International Floral Design School. 1st place — — certificate to study at 1 000 euros. in Araik Galstyan Moscow International Floral Design School. Audience Award — the publication in the «Flower World» magazine and a special cup. 3rd place -Certificate to study for 500 euros Araik Galstyan Moscow International Floral Design School. 2nd place — -Certificate to study 1,000 euros Araik Galstyan Moscow International Floral Design School. 1st place — — certificate to study for 2 000 euros. 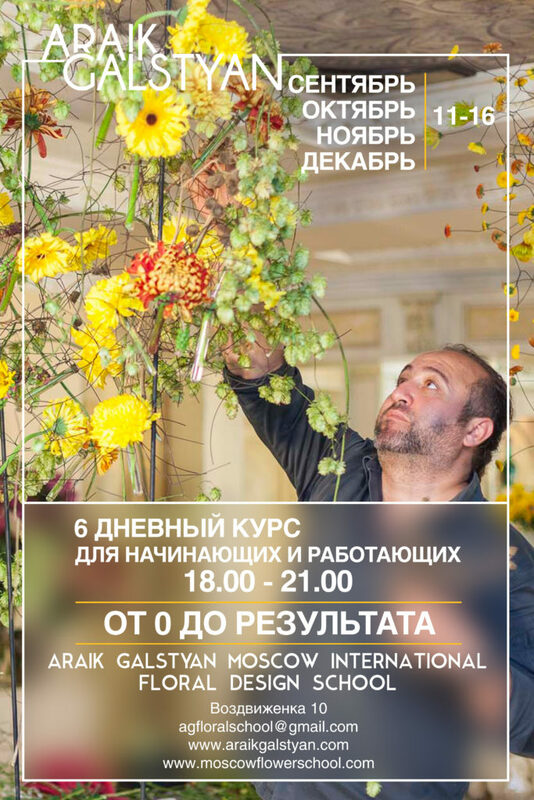 in Araik Galstyan Moscow International Floral Design School. 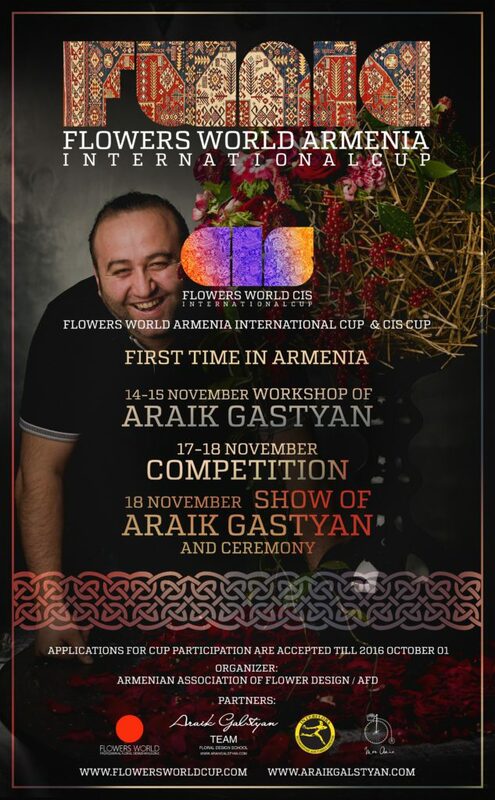 Participate in ARMENIA INTERNATIONAL CUP competition can only Armenians from Armenia and around the world with experience in floristry from 3 years and is currently working on a specialty. Participate in CIS INTERNATIONAL CUP competition can residents of the CIS and International countries with experience in floristry from 3 years and is currently working on a specialty. For the consideration of the application must be sent to the address: flowersworldcup@gmail.com. The participation fee of 500 Euro. The price includes a 2-day seminar Araik Galstyan 14-15 November. Winner ARMENIA INTERNATIONAL CUP will receive support from the Association of Armenian Association of Flower Design and the opportunity to present Armenia in all international competitions, including the World CUP and Europe CUP. Winner from CIS will be have the opportunity to present his country in all international competitions, including the World CUP and Europe CUP. The main objective of the competition — enhancing the prestige of the profession florist designer and help Armenians enter the international arena, in the international market. Our mission is to maintain a respectful attitude towards the flowers and wildlife, floristic propaganda as a kind of world culture and support cultural exchanges between different countries in the world.